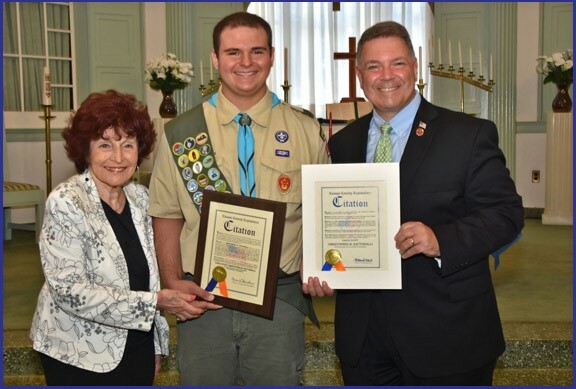 Nassau County Legislator Steve Rhoads attended Boy Scout Troop 192’s Eagle Court of Honor for Eagle Scout Christopher M. Rattoballi at the Bellmore Presbyterian Church. Christopher is a resident of Bellmore. For his project, Christopher designed, built and installed map boards around Wantagh Park located in Wantagh. Shown in photo, left to right: Presiding Officer Gonsalves, Eagle Scout Christopher M. Rattoballi and Legislator Steve Rhoads.